I'll give you a hint. What's the heading of the page? What version of ColdFusion does it mention? OK: it's ColdFusion 10. So what are the docs about? ColdFusion Builder, ColdFusion 9 and ColdFusion 8 (which is end-of-lifed). 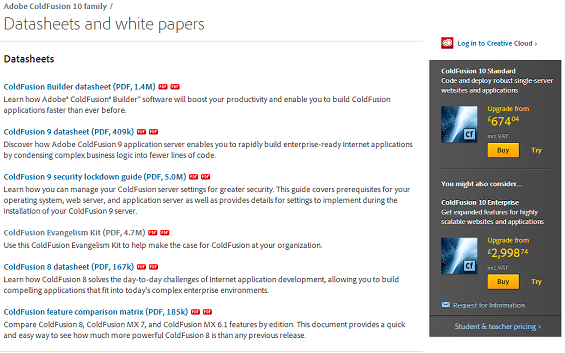 The only mention of the current version of ColdFusion on the page that has datasheets and white papers on that very product is the side bar asking me to buy it! To be slightly fair on Adobe, I can't see where the link to this page is on the actual "ColdFusion 10 Family" page is, but it's the third match when I google "coldfusion evangelism kit". More about that later. I just thought I'd advise that I'm about to get cross. Stay-tuned (or actually come back again in about six hours, that's when I should have something further to say on the subject).